Game On closed out the BVI Volleyball Association Power League’s Men’s Division play on Sunday at the Multipurpose Sports Complex with a Marathon five set thriller, a follow on to Dream Team’s grueling five set affair on Saturday night, highlighting weekend play. In the most competitive five setter of the season, Game On bested Raw Power, 25-22, 12-15, 25-23, 16-25 and a Marathon 24-22. Kwame Malcolm led Game On with 13 kills with Curtis Davis and Willis Potter adding 12 respectively. Travis Jack finished with 10 kills, seven blocks and five digs. Raw Power’s Frandi Martin recorded a game high 20 digs and 12 kills for for his double double. Edward Pollock missed a double double with 11 digs and nine kills. Against unbeaten Gunz For Life on Saturday, Dream Team needed all five sets for a see saw 25-22, 25-16, 22-25, 17-25 and 15-10 triumph. Dexter Danielle had a 15 kills and Canice Marquis followed up with 14 kills and nine digs while Miguel Martin added another 10 for the Dream Team. Damien Creque had 15 kills, 11 digs and five blocks to lead Guns For Life. 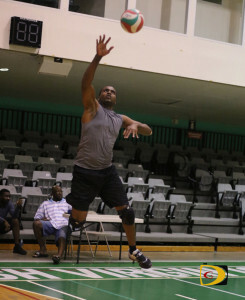 Neville Brathwaite narrowly missed a triple trouble with 11 kills 10 digs and nine blocks. Carldon Morton followed up with 10 kills and five digs. The other men’s game saw the Philipinas grabbing a straight set 25-11, 25-13 and 25-19 victory over the Virgin Gorda Hawks. In women’s play, Crush Dem won both their games as Shanna Williams had 12 digs during their 25-14, 20-25, 25-16 and 25-15 victory over School Them. Lohanny Santana recorded a season’s best 34 digs. Elecia Todman followed up with 15 digs and six kills. Jacintha Weeks had 19 digs and seven kills and Williams added 14 kills, in leading Crush Dem, to a 25-21, 18-25, 25-23 and 25-21 over Black Ops. Patricia Hodge dropped in 11 kills and four digs while Fara Osborne had nine digs and five kills. Trechia Laroque had 14 digs and Rayonne Frett followed up with 13 to go with nine blocks, for Black Ops.